Winged Pikmin (羽ピクミン?) are a Pikmin type that first appears in Pikmin 3. They are pink with large blue eyes, their bodies are striped in darker pink, and they have lavender flowers like Rock Pikmin. Their name comes from the transparent wings on their backs, which allows them to be airborne most of the time. This is particularly useful in combat and while carrying. Like other main Pikmin types, they are produced in an Onion, and appear in all of the game's modes, but the color of their buds and flowers is lavender, like the Rock Pikmin. Winged Pikmin carrying some pink pellets over water. 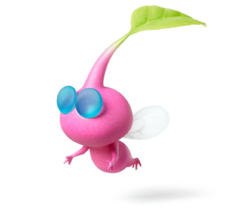 As their name implies, Winged Pikmin are capable of flight, and are constantly airborne. Winged Pikmin can also carry objects into the air, enabling them to take shortcuts, but they carry objects slower than other Pikmin types. Winged Pikmin behave differently when they carry objects alongside other Pikmin. Due to their constant airborne status, they can follow leaders more smoothly, as they can fly over obtrusions on the terrain, over water, or over pits. There are a few disadvantages, however. It's harder for them to take down small Pellet Posies (but still possible, with careful aim or by throwing from below), and if their leader is underwater they cannot be thrown at all. They are also weaker than other Pikmin types in terms of attack power, but the fact that they can fly makes fighting airborne enemies and specific weakpoints in larger enemies more convenient. Contrary to popular belief, Winged Pikmin do not cause more damage to flying enemies. Interestingly, Winged Pikmin cannot be crushed, except by the crystal cubes released from the final boss. Whenever they get hit by an attack that would crush regular Pikmin, Winged Pikmin are merely thrown backwards. It's possible for a Winged Pikmin to walk on the ground like any other Pikmin instead of flying. This can happen while building a bridge, digging, drinking nectar, going back to the Onion, pushing an obstacle such as an iron ball, attacking a gate, after being thrown away by an attack (if they are not called back and can't find an enemy to attack), after being inked or set ablaze (they will either fly or run), or when rescued from drowning (if the player whistles the Pikmin, it will fly, but if the Pikmin manages to escape alone, it will set foot on ground). They will also set foot on ground after sliding or using a geyser (in which case they will stay on ground until their leader moves). The Winged Onion trapped in the Arachnode's web. Winged Pikmin are discovered in the Twilight River. Across a river from where the leaders land is an Arachnode web, with a Winged Onion trapped in it. Scattered across the area are blue fragments for a large blue bridge, which leads to the opposite shore. Destroying the Arachnode that owns the trap will free the Winged Onion from its grasp. After doing so, it will release a single Winged Pikmin seed, allowing more Pikmin to be propagated. The ideal way to do this is with the flukeweeds in the Onion's site, and through Pellet Posies on the other sides of small ponds, which both demonstrate the Pikmin's ability to fly. The Winged Pikmin are later used in the area to allow lily pads to flow to the second half of the area. As with other Onions, the Winged Onion merges with the main Onion at the end of the day. Winged Pikmin must be used for the collection of the following fruits and the completion of the following tasks. There are no known exploits or ways for other Pikmin to complete these goals. Velvety Dreamdrop (Garden of Hope): It is located under a clipboard which requires Winged Pikmin to lift. Velvety Dreamdrop (Tropical Wilds): It is located in a cavern underneath the red bridge. When inside the cavern the fruit will be under a flukeweed. Searing Acidshock (Twilight River): This fruit is underneath a flukeweed. Lesser Mock Bottom: Both in the Twilight River and the Garden of Hope, the fruit is under a flukeweed. Astringent Clump: The one in the Distant Tundra requires that a bamboo gate be lifted. Bamboo gate: 10 Winged Pikmin are required to lift a bamboo gate. Blue Onion: The Onion is attached to a flukeweed that needs to be pulled out. Dam: The dam that blocks the lily pads in the Twilight River must be opened with flukeweeds. Clipboard: Winged Pikmin are required to lift clipboards. Flukeweed: Winged Pikmin are required to uproot flukeweeds. Winged Pikmin are recommended for the following tasks, but are not strictly mandatory. Searing Acidshock (Tropical Wilds): With the one obtained from the Calcified Crushblat, either Winged or Blue Pikmin must be present to carry the fruit back. Stellar Extrusion (Tropical Wilds): It can be obtained using Yellow Pikmin and the scales in the Tropical Wilds, but it is much easier to obtain by manipulating the camera and swarming Winged Pikmin at it. Astringent Clump (Garden of Hope): The elevator platforms are meant to be used, but it is easier to have Winged Pikmin fly up and obtain the fruit. Delectable Bouquet (Twilight River): The fruit is too high up for Yellow Pikmin to adequately reach until the second half of the area is discovered. Winged Pikmin can easily collect it beforehand. Dusk Pustules: The ones in the Twilight River are more convenient to obtain with Winged Pikmin, as the paths Blue Pikmin must take are harder to figure out on first glance. The ones in the Garden of Hope normally require a scale puzzle to be properly collected, a puzzle that Winged Pikmin bypass entirely. Portable Sunset (Twilight River): The safest method of obtaining this requires that a bamboo gate be lifted. Alternatively, three Orange Bulborbs can be fought. Flighty Joustmite: When airborne, charging Winged Pikmin at it will send it crashing to the ground. Arachnode: Any type of Pikmin can attack the creature, but Winged Pikmin can reach it more easily. Scornet: Winged Pikmin can most easily reach a swarm and take each Scornet out, sometimes before the swarm can even attack. Scornet Maestro: Winged Pikmin are needed to ground the creature, although it can be defeated by Rock Pikmin, as they can damage it while it's airborne, whereas all other Pikmin types get shaken off. Burrowing Snagret: Although any Pikmin type can be used to defeat Burrowing Snagrets, Winged Pikmin are the only type that can charge at it, and by charging at it with a large number of Winged Pikmin, it can be defeated in a few seconds. Main article: Winged Pikmin carrying properties. Because carrier Winged Pikmin are in constant flight, they have unique carrying properties that differ from the other Pikmin types. When carrying an object, Winged Pikmin will fly with it through the air, making it difficult to call them back with the ground whistle. Instead, they must be called by holding / / , which will eventually summon a cylindrical beam of light that will call the Winged Pikmin, or by simpling whistling while aiming at the object they are carrying. As stated, Winged Pikmin are capable of flying over obstacles, but are considerably slow whilst carrying. This can cause traffic in groups of Pikmin trying to return spoils to base, as Winged Pikmin slowly carrying an object in the front of the line will cause the rest of the Pikmin to get held up behind them. If multiple types of Pikmin are carrying something that a Winged Pikmin is also carrying, the Winged Pikmin will carry it closer to the ground and will not fly with it. However, if the number of Winged Pikmin carrying is the number of Pikmin required to lift the object, they will lift it into the air, causing any ground-based Pikmin trying to carry the object to let go, or to cling on for a few seconds before falling off. Due to this behavior, and combined with the fact that idle Pikmin are prone to assisting nearby Pikmin who are carrying an item, idle Winged Pikmin are known to "steal" spoils from other types of Pikmin by unintentionally snatching them away from the other Pikmin as they try to fly with it. Winged Pikmin appear in Super Smash Bros. for Nintendo 3DS and Wii U as a trophy and as part of one of Olimar's moves: "Winged Pikmin". This is Olimar's main recovery method, and when used, two Winged Pikmin instantly spawn and grab Olimar, carrying him upwards. Olimar will also carry any Pikmin that were in his party prior to the start of the move, but the more Pikmin that are being carried, the harder the Winged Pikmin have to fly, and the less distance they cover before giving up. The introduction cutscene for when Winged Pikmin are found. Finding the first Winged Pikmin (leaf). Finding the first Winged Pikmin (bud). Finding the first Winged Pikmin (flower). Some Winged Pikmin follow Alph, flying over a body of water. Winged Pikmin fighting a Swooping Snitchbug. A Winged Pikmin setting foot on the ground. A Winged Pikmin setting foot on the ground. This can happen while they are building a bridge. Some Winged Pikmin attacking a gate. Notice they walk instead of flying in this case. The spirit of a Winged Pikmin. Note the wings. If a Winged Pikmin sets foot on ground (by being thrown) before attacking an enemy, and then it is set ablaze, it will start running. Otherwise, it will fly. Like the previous image, if it starts drowning instead, it will run. Otherwise, it will fly. Like the previous images, but with ink. If the player whistles a drowning Winged Pikmin, it will escape from the water by flying. If the Pikmin manages to escape alone, it will walk instead. A Winged Pikmin setting foot on ground while digging. Winged Pikmin sliding and then setting foot on ground. After using a geyser, Winged Pikmin will stay on the ground until a leader moves again. Winged Pikmin can walk while drinking nectar. Winged Pikmin walking after a sequence break has been performed. (see Trivia section for more information). A Winged Pikmin going back to its Onion. Note that it is running instead of flying. The data file explaining Winged Pikmin's flying ability. The data file explaining Winged Pikmin's ability to pull Flukeweed. The data file explaining Winged Pikmin's lackluster attack strength. The data file explaining Winged Pikmin's advantage against airborne targets. Artwork of Winged Pikmin flying. In an early version of Pikmin 3, Winged Pikmin had blue flowers. The Winged Pikmin aircraft in the Red Bull Flugtag event. If Winged Pikmin are dismissed over an abyss, they raise up a bit before finally becoming idle. They can be whistled back and re-dismissed to raise continuously higher, to the point where the whistle cannot reach them any more. It's actually possible for a Sputtlefish to ink a Winged Pikmin in the Garden of Hope. This is unlikely to occur in normal gameplay, though it's not a glitch. Using a sequence break, it's possible to unlock Winged Pikmin without building a certain bridge. If, however, Winged Pikmin are told to construct this bridge, they will not take a path in the air, but instead will take the same path as the other Pikmin types, and so they will walk instead of flying. Finally, this can also happen if the main bridges in the Distant Tundra were skipped. They were revealed in a Nintendo Direct broadcast on April 17th, 2013 as the eighth Pikmin type in the series. To help advertise Pikmin 3, Nintendo of Canada participated in the 2013 Red Bull Flugtag event, with some representatives dressed in Pikmin and leader suits riding a Winged Pikmin aircraft. The aircraft didn't hover much and dipped right away, awarding the participants a total score of 16.24. ↑ YouTube video showing how a Sputtlefish can poison a Winged Pikmin. ↑ YouTube video showing Winged Pikmin walking instead of flying in the Twilight River. ↑ YouTube video showing Winged Pikmin walking in the Distant Tundra.